David W. Hoyt, The old families of Salisbury and Amesbury Massachusetts : with some related families of Newbury, Haverhill, Ipswich, and Hampton, and of York County, Maine / David W. Hoyt., , at https://archive.org/stream/cu31924025963772 . Providence, R. I.: Snow & Farnham, (1897) , p. 34.
living at Lee, Penobscot County, Maine. "New Hampshire, Death Records, 1654-1947," index and images, FamilySearch (https://familysearch.org/pal:/MM9.1.1/FS24-BBM : accessed 27 Nov 2012), Eleanor R Hale, 11 Apr 1890. 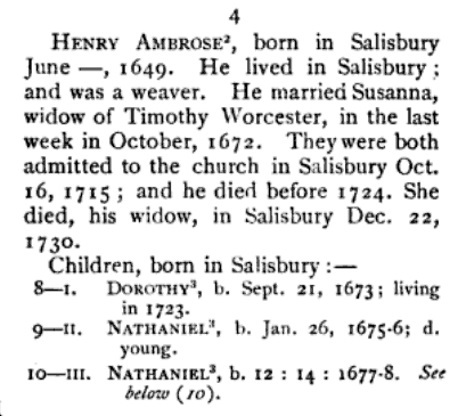 "Maine, Births and Christenings, 1739-1900," index, FamilySearch (https://familysearch.org/pal:/MM9.1.1/F4CR-72K : accessed 27 Nov 2012), Elenor Ames, 03 Sep 1823; citing reference , FHL microfilm 11531. "Maine, Marriages, 1771-1907," index, FamilySearch (https://familysearch.org/pal:/MM9.1.1/F4XH-M65 : accessed 25 Nov 2012), John R. Hale and Eleanor R. Ames, 19 Jun 1845; citing reference , FHL microfilm 11531. 1880 United States. Census Office. 10th census, 1880 federal population census, Washington, District of Columbia: National Archives and Records Service, ([19--]) , Census Place: Farmington, Strafford, New Hampshire; Roll: T9_769; Family History Film: 1254769; Page: 183.2000; Enumeration District: 250; Image: 0367. 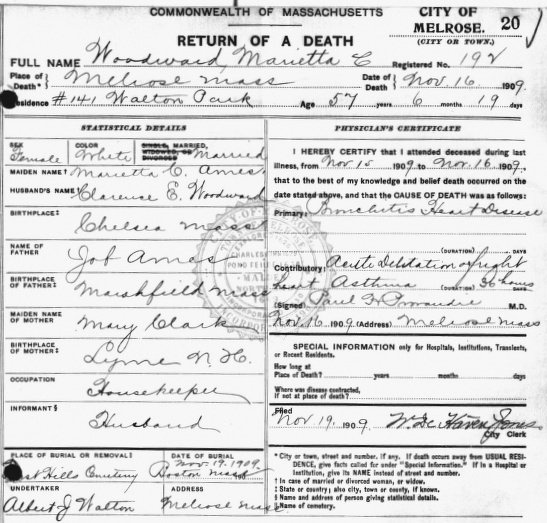 Marietta died on November 16, 1909 in Melrose, Massachusetts, at age 57. She was buried on November 19, 1909 in Forest Hills Cemetery, Jamaica Plain, Massachusetts, She was buried from 7 to 14 ft in front of headstone, centered in the same location as Ethel Ames Woodward, to right of Clarence E. & Mary A. Woodward, and to left of W. Elliot & Alice B. Woodward in Lot 1543 Arethusa Path. Massachusetts Vital Records, 1841-1910, , Vol: 327 ; Page: 235. Clarence Woodward & family Gravestone, Forest Hills Cemetery, 95 Forest Hills Ave., Boston, Massachusetts; photographed by S. G. Levine, Year only. Boston Daily Advertiser, Boston, MA: , Monday, July 20, 1896; pg. 6; Issue 17; col A.
Clarence Woodward & family Gravestone, Forest Hills Cemetery, 95 Forest Hills Ave., Boston, Massachusetts. living at Park St., Bethel, Oxford County, Maine. "Maine Marriages, 1771-1907," database, FamilySearch (https://familysearch.org/ark:/61903/1:1:F4FJ-XWP : 4 December 2014), Charles C. Farwell and Abbie W. Andrews, 27 Apr 1871; citing Lovell,Oxford,Maine, reference ; FHL microfilm 11,541. 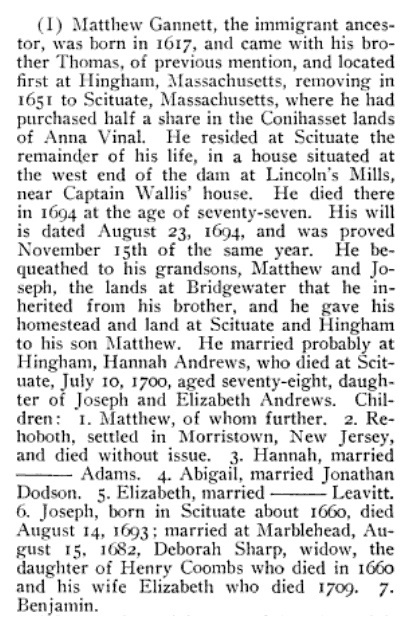 "Maine Births and Christenings, 1739-1900," database, FamilySearch (https://familysearch.org/ark:/61903/1:1:F43P-6TL : 4 December 2014), Abba W. Andrews, 26 Jun 1851; citing CIVIL, LOVELL, OXFORD, MAINE; FHL microfilm 11,541. 1880 United States. Census Office. 10th census, 1880 federal population census, Washington, District of Columbia: National Archives and Records Service, ([19--]) , Census Place Bethel, Oxford, Maine, Family History Library Film 1254484, NA Film Number T9-0484, Page Number 28A. 1900 United States. Census Office. 12th census, 1900 population census schedules, Washington, District of Columbia: Bureau of the Census Micro-Film Laboratory, ([197-]) , Census Place: Bethel, Oxford, Maine; Roll: T623 596; Page: 5B; Enumeration District: 179. "Minnesota, Deaths and Burials, 1835-1990," index, FamilySearch (https://familysearch.org/pal:/MM9.1.1/FDZT-ZFC : accessed 23 Dec 2012), Charles F. Colby in entry for Emma Estelle Andrews Colby, 29 Nov 1927. "Minnesota Death Index, 1908-2002," database, FamilySearch (https://familysearch.org/ark:/61903/1:1:V4HJ-LJ8 : accessed 5 April 2016), Emma Estelle Andrews Colby, 29 Nov 1927; from "Minnesota Death Index, 1908-2002," database, Ancestry (http://www.ancestry.com : 2001); citing Hennepin, Minnesota, record 497069, certificate number 021417, Minnesota Department of Health, Minneapolis. History of the Town of Hingham, Massachusetts, , at https://archive.org/stream/historyoftownofh0203hing . Cambridge: John Wilson and Son, (1893) , vol. 2, p. 242. Edward Doubleday Harris, An Account of Some of the Descendants of Capt. Thomas Brattle, , at https://books.google.com/books?id=TCpdU6wTCm4C . Boston: D. Clapp and Son, (1867) , p. 45. Lydia married Clark B. Woodward, son of John Woodward Jr. and Sarah Elizabeth Bunker, on July 2, 1870 in Wilmot, Merrimack County, New Hampshire.....Residence: Wilmot, N.H. The birth record of Ralph Edson Woodward on May 18, 1882 was corrected on 3 March 1938, and lists the mother as Jennie L. Andrews.....Birthplace: Wilmot, N.H.
Name of person reporting death: P. R. Hoyt, M.D. Place of interment: Wilmot, N.H.
Undertaker: E. D. Ward Co.
New Hampshire. Registrar of Vital Statistics, Index to deaths, early to 1900, Salt Lake City: Filmed by the Genealogical Society of Utah, (1974) Microfilm #1001068 of the Family History Library, Salt Lake City, Utah, Microfilm #1001068 of the Family History Library, Salt Lake City, Utah: Index to deaths - Colburn to Conway , certified by Earl Flanders, town clerk of Laconia, N.H.
"New Hampshire, Marriage Records, 1637-1947," index and images, FamilySearch (https://familysearch.org/pal:/MM9.1.1/FLXK-PDM : accessed 30 Nov 2012), Clark B. Woodward and Josephine A. Smith and null, 1896. Record of Divorce. The State of New Hampshire, , certified by R. J. Shurtliff, Clerk of Merrimack Superior Court. 1910 United States. Bureau of the Census. 13th census, 1910 population census schedules, Washington, District of Columbia: Bureau of Census Micro-Film Lab, ([19--?]) , Census Place: Andover, Merrimack, New Hampshire; Roll: T624_864; Page: 8B; Enumeration District: 184; Image: 437. 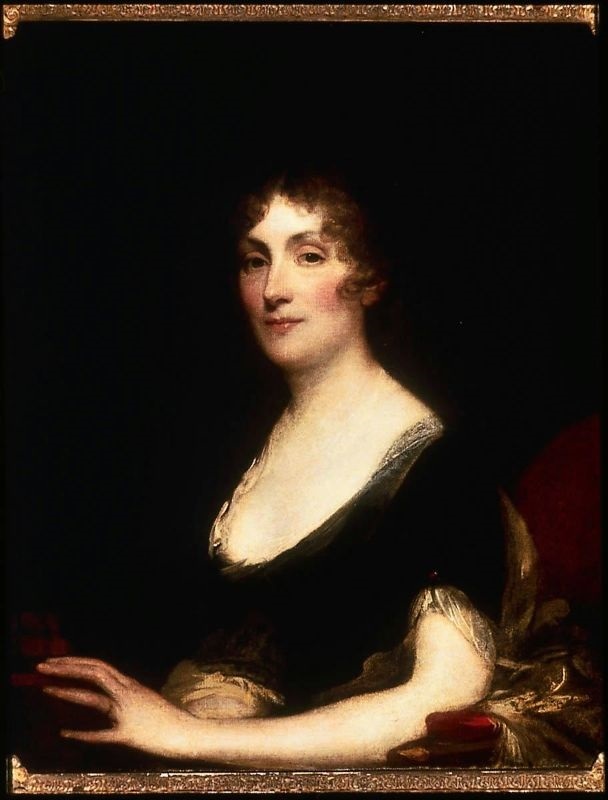 Lydia married Hiram Roys, son of James Roys and Olive Hinman, on January 27, 1820 in Norfolk, Connecticut. Helen Elizabeth Royce, The Royce genealogy (Roys, Rice, Royse), Salt Lake City, Utah: Filmed by the Genealogical Society of Utah, (1950) , p. 480. 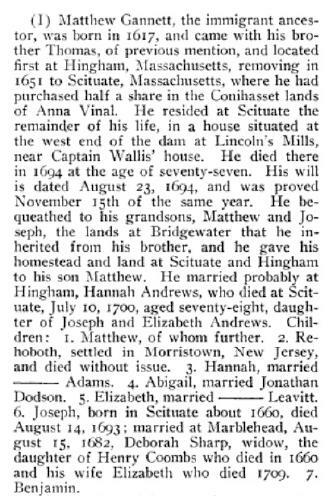 Donald Lines Jacobus, Families of Ancient New Haven, (1922-32) , p. 1550. Thomas W. Baldwin, Vital Records of Cambridge, Massachusetts, to the year 1850, Boston: Wright & Potter Print. Co., (1914) , Vol. 1, p. 23. Vital Records of Medford, Massachusetts To the Year 1850, Boston, Mass. : The New England Historic Genealogical Society, (1907) , p. 179. Vital Records of Medford, Massachusetts To the Year 1850, Boston, Mass. : The New England Historic Genealogical Society, (1907) , p. 335. Vital Records of Medford, Massachusetts To the Year 1850, Boston, Mass. : The New England Historic Genealogical Society, (1907) , p. 15.